Continuing Analysis and Surveillance System or CASS has been a commercial aviation safety and reliability process that has been around for years. What is the purpose of this system you ask? “The high-level purpose of a CASS is to reduce or eliminate the likelihood of your aircraft being approved for RTS when it is not airworthy through the continuous, system safety-based, closed-loop cycle of surveillance, investigation, data collection, analysis, corrective action, monitoring, and feedback of a CASS.” FAA Advisory Circular 120-79A. Now some of you reading this might wonder, what do I care about CASS since it relates to aircraft airworthiness. The point of this discussion, as the title implies, is that in this author’s opinion the principles and processes can be utilized in other industries where there are complex capital assets with long lifecycles. The tenants of CASS fit nicely into the Service Lifecycle Management (SLM) strategy in being able to better manage your asset or product throughout its lifecycle from delivery to retirement. 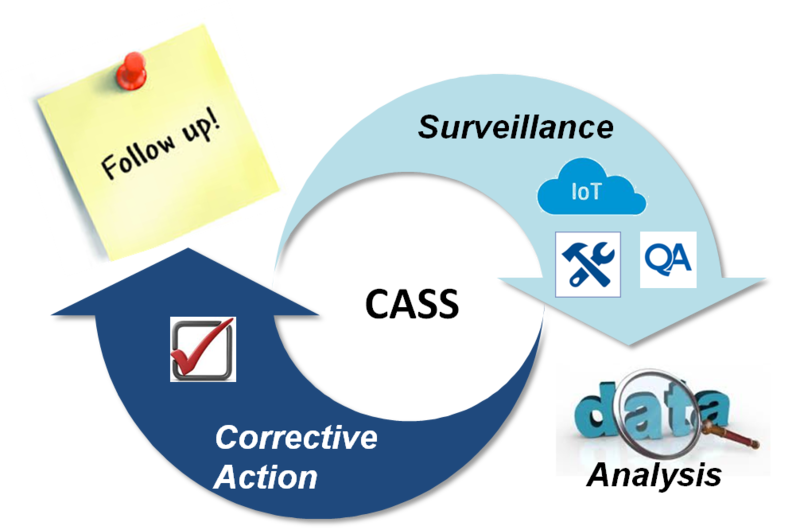 The foundation of CASS is the data and the effectiveness is based on the closed-loop analysis and corrective action processes – all of which can be accomplished whether you are an operator, OEM or 3rd party provider. The other factor that should be considered besides the data in an SLM strategy is to ensure that there are resources, tools and defined processes for the closed-loop cycle of the CASS process. In commercial airlines, a formal board is established to review findings and trends identified during the CASS process. The board also holds process stakeholders accountable for the corrective action solutions and implementation. These process control structures will enable organizations to measure the effectiveness of the program against the operation and ensure that the process continually evolves as new technologies, product features and organizational changes occur. As you consider this information the point here is that the concept of CASS can be applied to more than just the aviation community. Yes, it was born there to manage complex assets that require high levels of operational safety, yet the practical aspects of the program can be utilized in other industries. One area that needs further comment is that as you develop your SLM strategy around CASS type processes, it is important that there is an accompanying technology strategy. The technology strategy should take into account what built-in IoT or maintenance diagnostics are on the asset and identify the ecosystem of service based systems that will need to be part of the data integration effort. This data integration effort should also include Service Level Agreements with customers or 3rd party providers in what, how often and use restrictions are involved in the data collection efforts. Additionally, the strategy must include consideration of analysis tools that will help in identifying asset mechanical and operational risk. The analytical tools and methodologies should consider machine-to-machine learning, visualization, trending, correlations and other statistical capabilities that can help to proactively identify risk and opportunities for improvement. Lastly, since CASS is a process, make sure you develop a process framework that works for your organization. Ensure that you have stakeholder support from the various key departments that will utilize the process and as mentioned above, capture the findings and corrective actions to build knowledge about the asset as it ages. The FAA Advisory Circular 120-79A, which can be found at; http://www.faa.gov/documentLibrary/media/Advisory_Circular/AC%20120-79A.pdf ; can be an excellent resource in helping you develop the processes and procedures for a closed-loop type CASS program or give you insights on improving a similar program you might already have in place.